With home computers now able to print in exquisite detail with millions of color combinations, many people choose to print their own party invitations, but choosing the proper invitation paper can be a challenge. To create fabulous invitations, it is important to consider the specific event, the type of paper, and any necessary accessories. The first step toward creating great invitations is to determine which type of party you want to have. Just knowing the holiday or special event isn't specific enough. A Christmas party, for example, may be a formal dinner, a tree-trimming celebration, a caroling party, an evening soiree, or a cookie exchange. Each type of event necessitates a slightly different invitation and the appropriate paper to print it on. The invitation sets the mood for the party as well as conveys the necessary information. The paper design, weight and style should help convey both the festive air and the critical details. Formal parties may require simple, elegant papers with a heavier weight, while casual fetes may use smaller cards with bold colors and fun quips. Having an idea about the intent of the party prior to choosing invitation paper is a key step toward creating a uniform theme and a stylish event. The following websites sell a wide variety of invitation paper suitable for any occasion. Basic Paper: This is standard 8.5 x 11 inch printer paper, usually white, ivory or other solid colors, and it's available in a limited range of weights. Unless the party is very casual, or only a sign is needed to invite many individuals (coworkers, for example), this paper is not usually appropriate for invitations. Decorative Paper: The same size and weight as basic paper, this paper comes in a range of different designs and colors. Choosing a border or watermarked background to match the party theme is a great way to use this relatively inexpensive paper to set the mood with creative invitations. Cardstock: This heavyweight paper comes in standard 8.5 x 11 inch dimensions and can be found in a range of colors. Handmade Paper: Individually crafted sheets of heavy paper may include pressed flowers, leaves, glitter or other accents right in the paper. This paper cannot usually be printed on and may not withstand folding or other stress easily. Vellum: A thin, translucent type of paper that may be plain, colored or patterned, and is often used to overlay a bolder pattern or to cover an invitation. 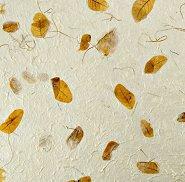 Parchment: An older type of paper with rough texture from less refined manufacturing processes. It is suitable for invitations, but it may not be suitable for printing. Photo Paper: Specially formulated paper for printing quality prints of photographs. Special printers are usually required for the best results with this paper. Tissue: Extremely thin, delicate paper that may be used to separate pieces of invitations such as response cards and other inserts. Since modern inks dry thoroughly, tissue is generally not required. Printable Invitations: These kits are usually 4 x 6 or 3 x 5 sizes and may have embossed edges or metallic accents on cardstock or vellum papers. Many kits also include accessories as well as templates for standard printers and word processing programs to make printing at home a breeze. 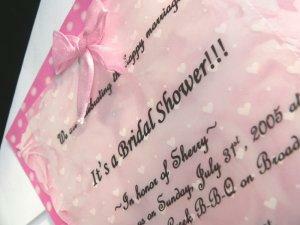 Combining several types of paper can create an attractive invitation. Try printing the invitation wording on plain vellum paper and layering it over handmade or patterned paper for an invitation that not only looks nice, but is easy to read. Size: Is there enough room for all the information to be printed without being cramped? Readability: Is the paper easy to read with the chosen font and ink color? Appropriateness: Does the pattern or color match the occasion or party theme? Expense: Are the invitations affordable enough not to compromise the party budget? Before printing invitations, it is wise to create a sample and use either a practice sheet of paper or a blank sheet to check for alignment, ink supply, and coloration. Note that the specific colors printed on a white sheet of basic paper may differ slightly from when they are printed on vellum or other specialty papers. Only print a few invitations at a time in order to keep an eye on the ink supply and to prevent paper jams, and do not stack invitations until they are completely dry. Basic paper, cardstock, and most printable invitations dry quickly, while vellum may take several minutes to dry thoroughly. Before committing to a specific type of invitation paper, double check to be sure it can be printed on correctly. Some papers are treated for use only with laser printers, while others can print with inkjet machines just as well. There are many types of invitation paper to choose from, and the best paper is one that not only can convey the critical date-time-location information, but one that also coordinates with the mood and theme of the event. The invitation, after all, is the first hint guests have about the nature of the party, and a great invitation sets the stage for a fabulous get together.